A few months ago I was summoned to the very top of the Hakone Turnpike along with a select group of other photographers and videographers. The guy doing the summoning was Ko-hey Takada, the Editor of Motorhead, which in the few years of its existence has redefined what Japanese car magazines should look, feel and even smell like. We were all there to go over a plan that had been laid out in detail months in advance; a plan that would ensure the second Hakone Hillclimb event would run like clockwork, smoothly unleashing some of the coolest cars in Japan up a road that on a daily basis allows pensioners in their Toyota Crowns to reach some of the most picturesque lookout spots in the touristy area. But the famed Turnpike would hardly be a tourist destination on this particular day – it was cold, dark and windy. We took over the car park at the top of the pass – a place where tourists can rest and grab a coffee or a hot steaming bowl of ramen. For the next couple of days this would become the pit area, each team setting up a small camp in which to look after their cars. 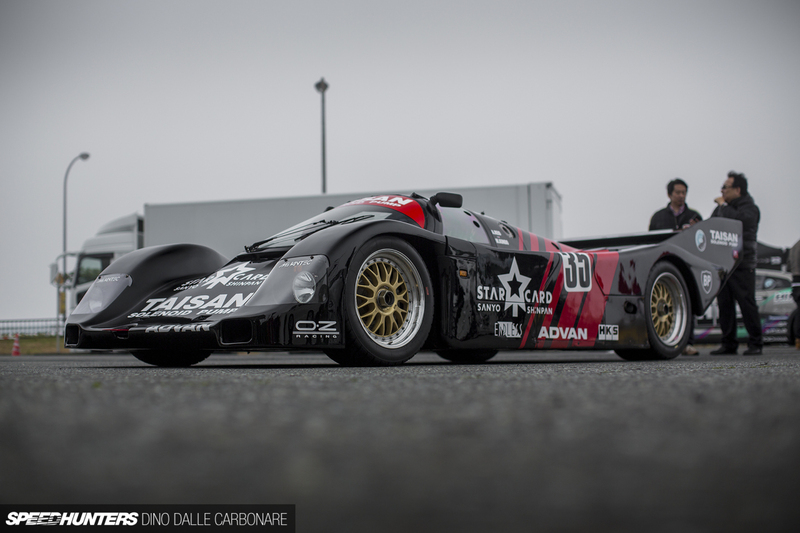 I’ll get to the event in a more detailed post next month; right now I want to concentrate on one of the entrants – namely the black Taisan Porsche 962C that back in 1994 competed in the JGTC championship. 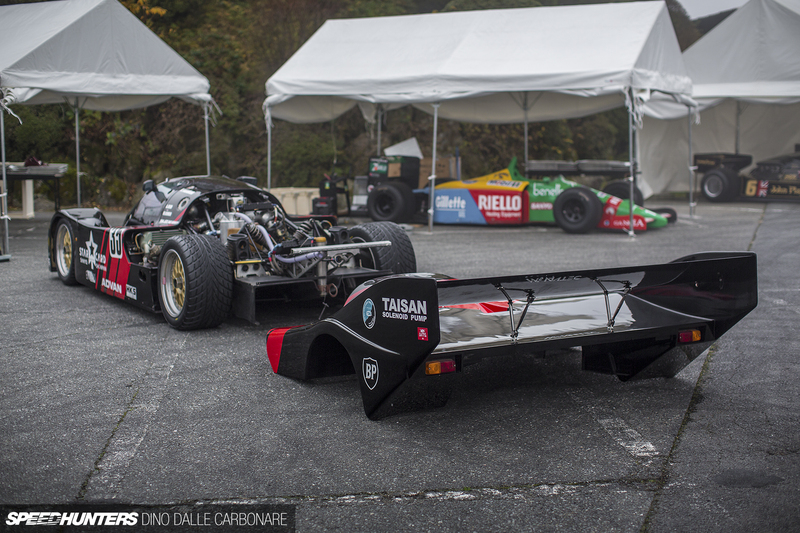 It was a very welcome addition to a rather wild line-up of cars being hammered up the epic driving road. Not only that, but the 962C comes from a rather special era of Japanese motorsports, with the 1994 season being the last time the R32 GT-R – specifically, the legendary Calsonic car – dominated in the field. The following year, the Calsonic R33 took over that duty. 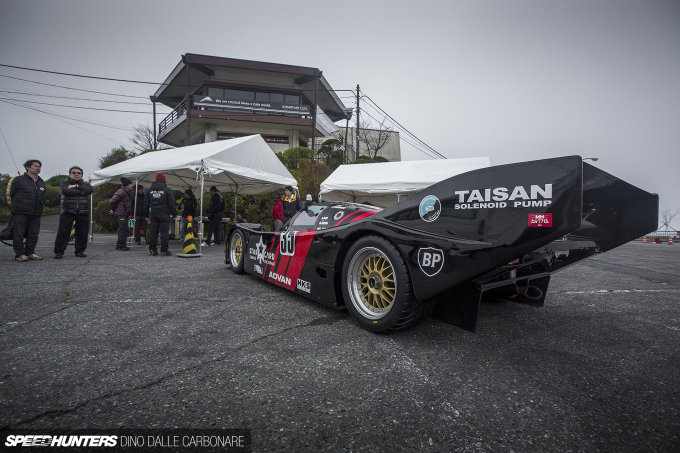 The Taisan 962C, which was entered in the GT1 class (think of it as GT500 nowadays), defined the series just as much as the GT-Rs, Supras and RX-7s that were also participating did. Within the GT1 ranks, an interesting and curious range of foreign metal was brought in and out of the five rounds that made up the championship. You can see what I mean in this short 10-minute video which recaps the ’94 season. 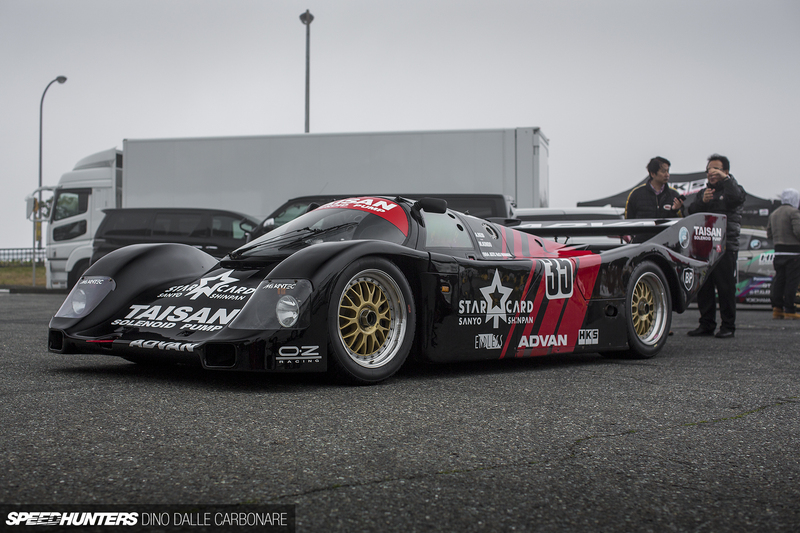 Take special notice of Round 3, where the Taisan Porsche 962C started off the front of the grid alongside the team’s second car, the Taisan Ferrari F40. Oh, the golden years, how we miss them! 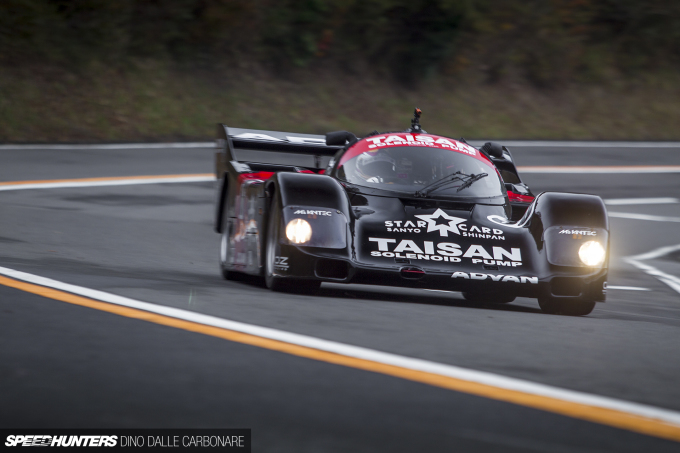 However, one thing to keep in mind is that by this time the 962 had been around for a decade; it was one hell of a successful platform with countless victories in series like IMSA, LeMans, and Daytona. The new owner of the 962C decided to allow Motorhead to use his car, partly because it was due for complete engine rebuild anyway. For the occasion, and with rain very much in the forecast for the main event, he even picked up sets of fresh wet and intermediate tyres, just in case. During the practice day prior to the event, I was lucky enough to get some time with the car. Lifting the lightweight carbon doors instantly revealed the vast cockpit, which for me at least was a stark reminder of how far race cars have come in the last 20 years or so. 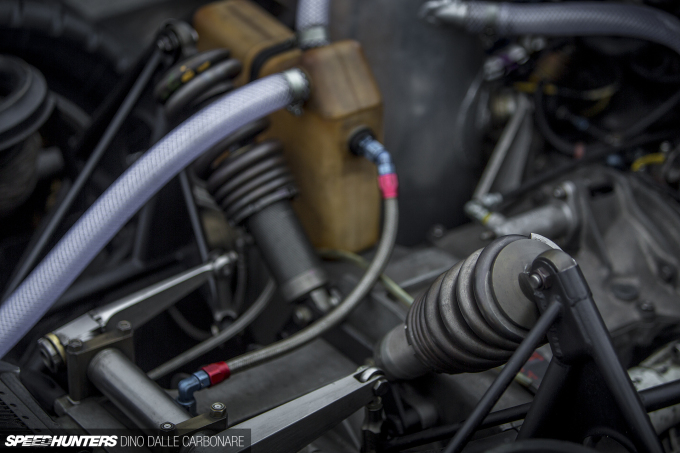 The first thing that caught my attention was the huge Bosch ECU connected up to all the sensors coming from the engine and other areas like suspension and gearbox. You would expect a car of this nature to sport a central driving position, but the driver actually sits on the right side. 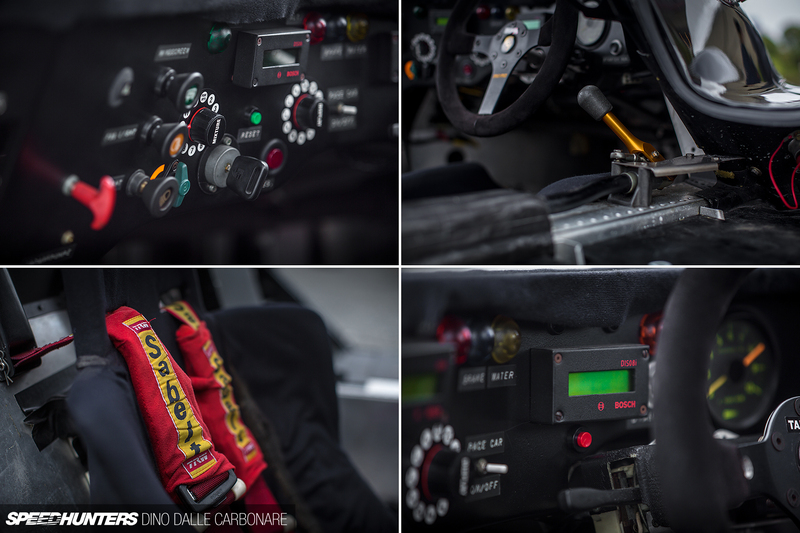 There’s just enough space for another seat in there, which is what Schuppan did back in 1994 with the 962CR. The owner of this Taisan car just happens to own that racing machine too, and if you recall, he likes to take it to his local Lawson to get his canned coffee fix. Two decades might as well equate to a century when it comes to how far electronics have progressed, and the dash certainly reminds you of this. 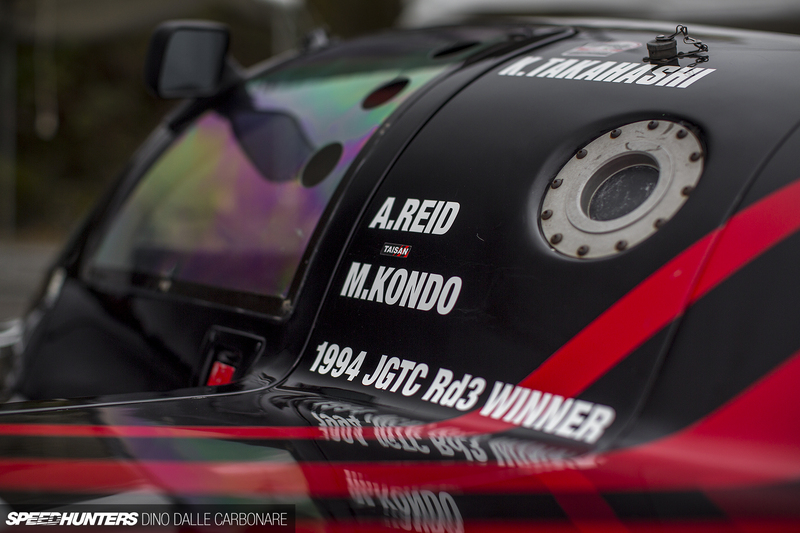 That said, all of this was pretty high-tech back then, and it allowed Team Taisan to keep the car competitive in the JGTC when facing off with the mighty AWD R32 GT-Rs and their seemingly unlimited potential. Oh and yes, this may be a foreign vision to modern day race car drivers, because that stubby orange anodised lever is actually, and get ready for this – a gear shifter! 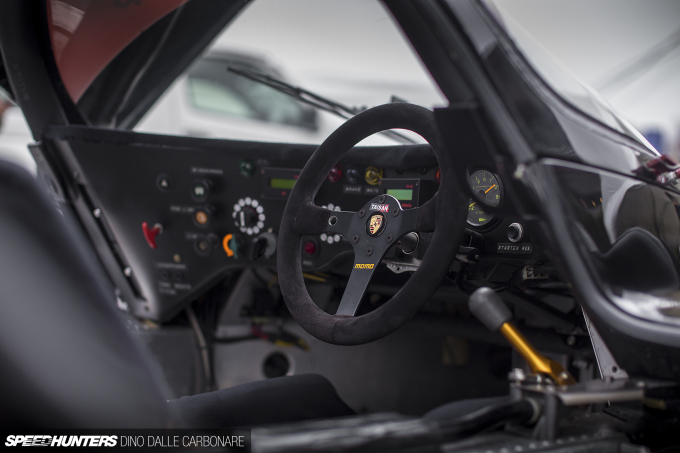 This means that driving the 962C in anger requires slightly more than clicking a paddle with your pinky finger as learned on your simulator. Skipping leg day is not an option either, as plenty of strength is required to actuate the dry single-plate clutch as you aggressively stir the H-patten ‘box. Scary, yes, but the owner felt safe as it was Super GT driver Seiji Ara who was entrusted to drive the Porsche. This is a guy that won LeMans back in 2004 with Audi, and now races with Team Studie and their BMW M6 GT3 in the GT300 class. As a kid, this sort of silhouette is what my car dreams were made of, so seeing the Taisan 962C at the top of a road that I drive so often was surreal. It’s as if it didn’t belong, but thanks to the guys at Motorhead and their negotiating skills with the Japanese government, this scene was made possible. And I’m sure you’ve noticed the other cars scattered around in the background. Yep, surreal is definitely the right word! But I wasn’t content; I had to see more. I asked the owner if I could take a look at the engine and he quickly ushered his mechanics over to lift off the massive rear cowl. It’s actually amazing how compact it all is once you strip it down to its aluminium chassis and the front and rear subframes where everything else is hung from. 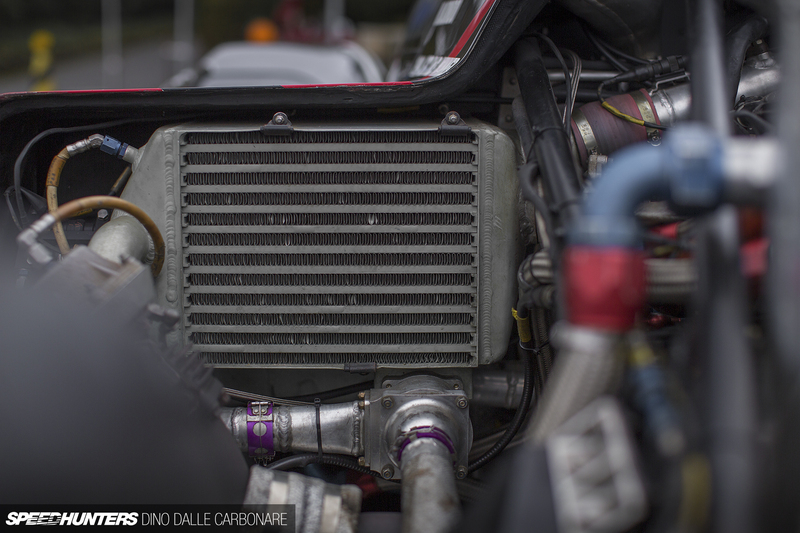 The first thing you’re drawn to are the turbos. 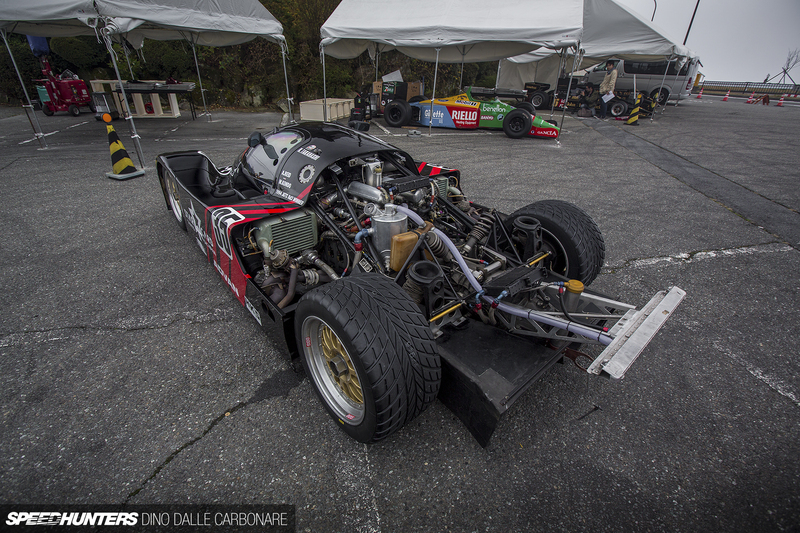 They sit far away from the engine, fed at each side by the exhaust headers coming straight out from the flat-six. 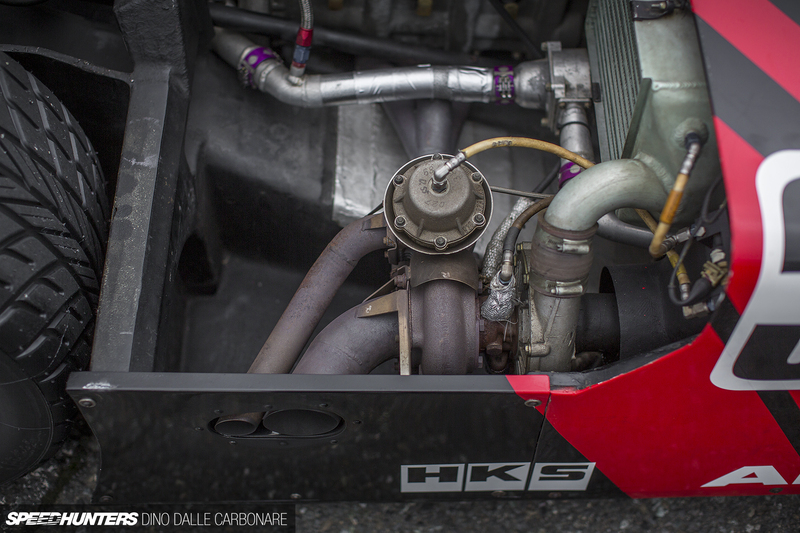 There’s a vintage feel compared to modern day forced induction systems we are used to seeing, but at the same time the twin KKK turbo setup with external wastegates is beautifully simple. As you can see above, in order keep to keep a level playing field in GT1 class of the 1994 JGTC, turbo restrictors were also required. Each turbo flows directly into an intercooler that takes up the entire opening of the 962C’s side air intakes. This then sends the cooled charge (usually compressed to about 1.5bar or 22psi), to the intake plenums, which then feed the flat-six. It’s all nicely packaged underneath a multitude of piping, most of which is part of the dry sump lubrication and the cooling system for the front-mounted radiator. 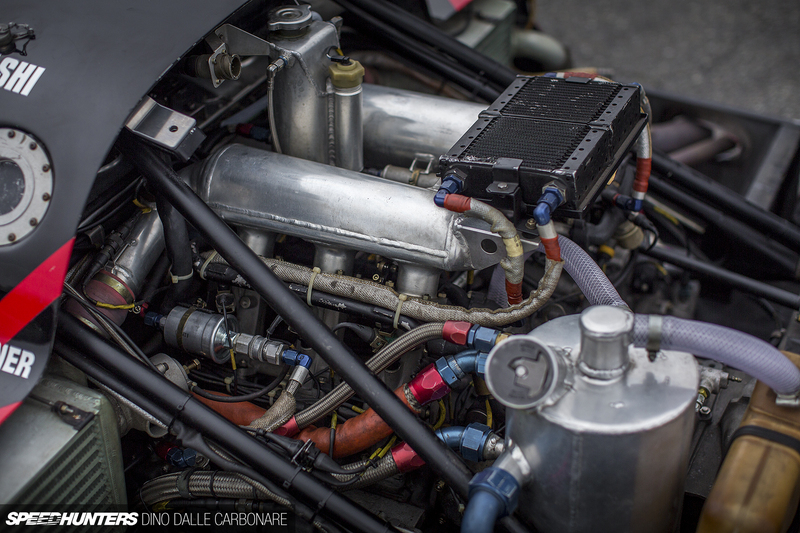 Yes, these engines were not air-cooled. The transmission and the subframe that holds the engine assembly in place doubles up as a mounting point for the lower wishbone/top rocker suspension assembly and adjustable sway bar setup. It’s beautifully raw and refreshingly mechanical. There’s a DIY feel about it too, like in the way they’ve integrated some old plastic canisters as breather tanks for the engine and transmission. 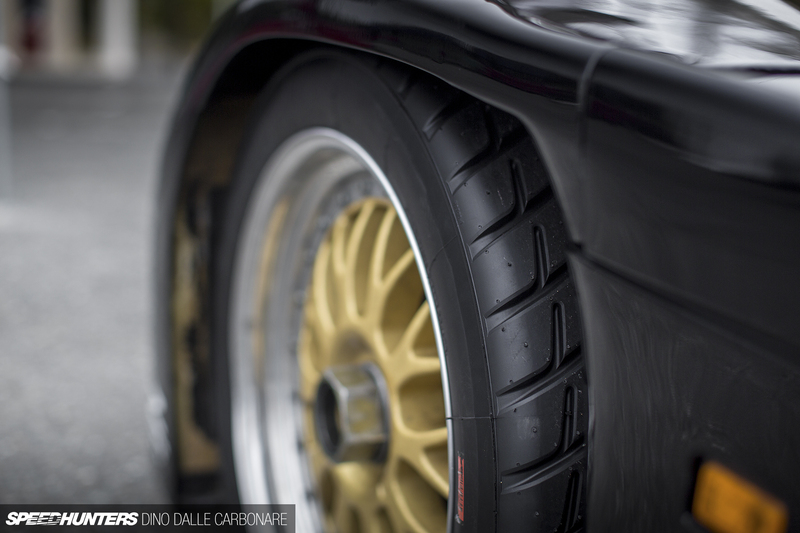 By comparison, modern day race cars are far too polished. They’re designed right down to the smallest of detail, which means that you never really end up seeing a lot of the componentry. It’s either boxed up as part of the aerodynamics or cooling, or housed in shielding for safety or protection. I’m not saying it’s a bad thing, but older race cars just have a more approachable feel, which allows you to walk up to them, stare at the engine for a bit and figure out what everything does. And of course, it all sounds pretty special too! I really give it up to the owner of this car. Not only does he make an effort to find and get his hands on such gems, but he uses them and allows them to be shared as well. 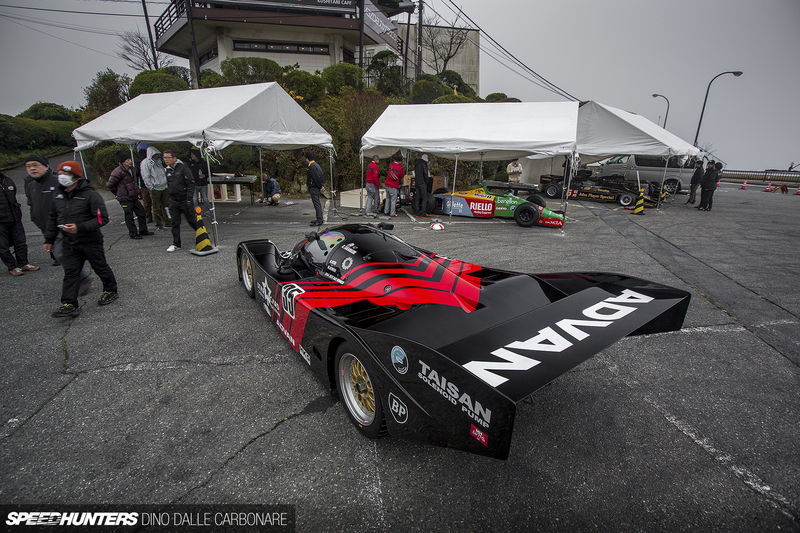 The 962C was part of a pretty cool line-up of cars for the Motorhead event, including a couple of rather important historical F1 cars. You’ll see more of those cars when I bring you the story on what goes on behind the scenes putting an event like this together. 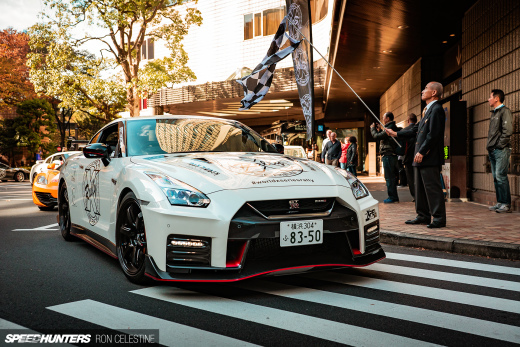 I just know that real Speedhunters out there would have wanted to see a feature on this car before the event coverage itself. Now the question is, what do cars like this Porsche mean to you? Damn Dino back at it again with the sick features. 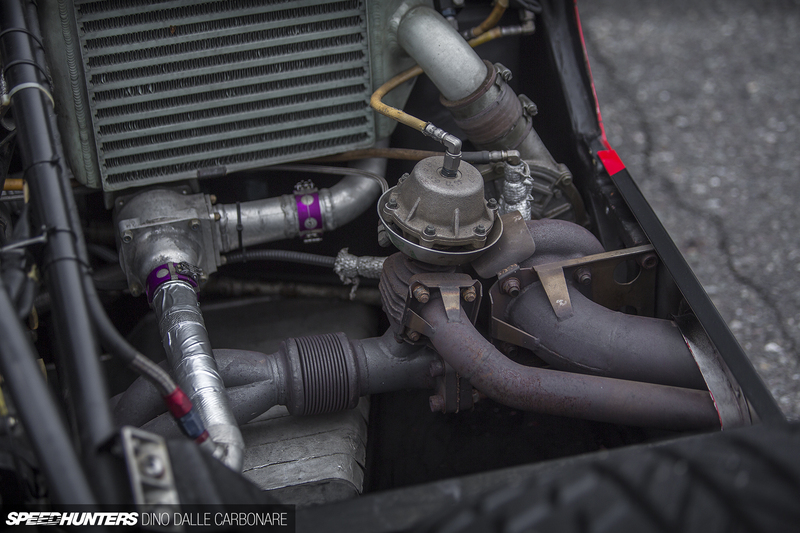 This is an excellent piece on a car which I am a huge fan of! Yess I miss the glory days to. I also agree on the way the cars where build back then...is almost like disecting and looking the inside of a body...looking the organs and veins etc when you see the hoses and the hold assembly...old race cars has that kind of feel & organic vibe to me...like they where alive. New race generations cars are build as you said and due to secrecy of whatever tech, methods or tricks they are using you don't get to see what's really going on. NO WAY!! JAPANESE GT CARS ON MOUNTAIN PASS!! I remember , while seeing the video of the Shuppan 962 ,i thought man the owner must get more credits, also one of the few who enjoy the working machinery and sharing it ,not only looking at it. and now you´re telling me this is the same guy, who lends its other 962 for such an event ?! There's no mistaking, this is the place in Hakone, where the last Initial D race was held. Look at photo No 2 and reread the last race chapters. That monster on a mountain pass? The driver is either really good or just plain has a deathwish (his name... Charles Bronson). 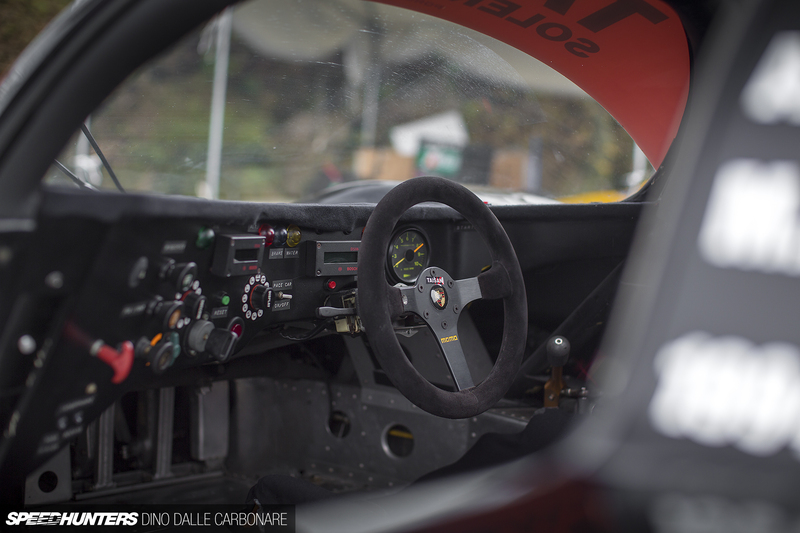 DMNDLFE driver is Seiji Ara JGTC and Le Mans (says in the article), he is pretty damn good mate. Great feature! A hillclimb event with a 962 and 70s an f90s f1s... (maybe 80s too? 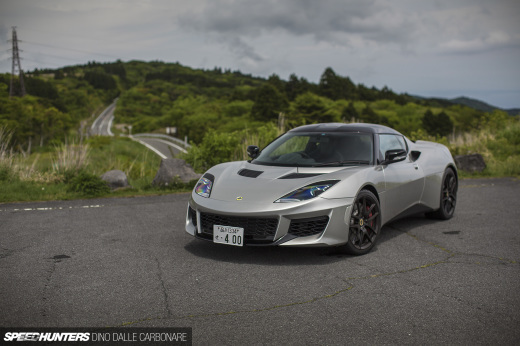 2nd JPS lotus in the background?) Mind is blown. Any details on the Benetton and the Lotus(es?) (models, drivers)? Great! Now that's an ECU! This is one of the reasons I still come to SH on a semi-regular basis.